Richard Thompson OBE, last week announced his 70th birthday celebration show at London’s Royal Albert Hall on September 30th 2019. The once in a lifetime concert will feature some very special guests, who will be announced in the coming weeks. Richard Thompson’s enduring musical influence and accomplishments are unparalleled. Having co-founded the ground-breaking group Fairport Convention as a teenager in the 1960s, he and his bandmates invented a distinctive strain of British folk rock. He left the group by the age of 21, followed by a decade long musical partnership with his then-wife Linda, to over 30 years as a highly successful solo artist. A wide range of musicians have recorded Thompson’s songs including Robert Plant, Elvis Costello, R.E.M., Sleater-Kinney, Del McCoury, Bonnie Raitt, Tom Jones, David Byrne, Don Henley, Los Lobos, and many more. His massive body of work includes many Grammy nominated albums as well as numerous soundtracks, including Werner Herzog’s Grizzly Man. 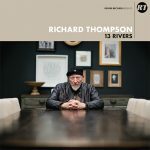 Thompson’s genre defying mastery of both acoustic and electric guitar along with engaging energy and onstage wit continue to earn him new fans and a place as one of the most distinctive virtuosos and writers in folk rock history. Powered by evocative songcraft, jaw-dropping guitar playing, and indefinable spirit, this venerable icon holds a coveted spot on Rolling Stone’s “100 Greatest Guitarists of All Time” and counts a Lifetime Achievement Award from the Americana Music Association in Nashville, and a Lifetime Achievement Award from the BBC Folk Awards among his many accolades. As well as celebrating Thompson’s milestone birthday, this unmissable show at London’s Royal Albert Hall on September 30th will be a fitting tribute to a truly exceptional artist.